US Navy/Mass Comm. Specialist 3rd Class Aaron ShelleyA Navy search-and-rescue swimmer aboard the guided-missile cruiser USS Bunker Hill, in background, retrieves a man-overboard mannequin during a seamanship-training exercise, February 11, 2011. Gerard Butler spent time aboard a Navy submarine to prepare for a role as a sub captain. While aboard, he observed a drill in which sailors tossed a bag of popcorn overboard and tried to rescue it. While popcorn isn’t required, most submarines use it. It’s a challenge to steer a submarine around fast enough to rescue a popcorn bag before it sinks. Scottish actor Gerard Butler stopped by the Pentagon earlier this week to promote his upcoming movie “Hunter Killer” by speaking to the press about how he worked with the Navy to research his role as an submarine captain. Among the details he revealed about his time aboard the nuclear-powered attack sub USS Houston at Pearl Harbour was a peculiar aspect of how a crew reacts after someone falls overboard. “I don’t know if I’m allowed to say this, but when you are doing a man overboard, rather than putting a man overboard, they throw a bag of popcorn into the water,” Butler told reporters. There’s more than a kernel of truth to Butler’s anecdote. US Navy/Mass Comm. 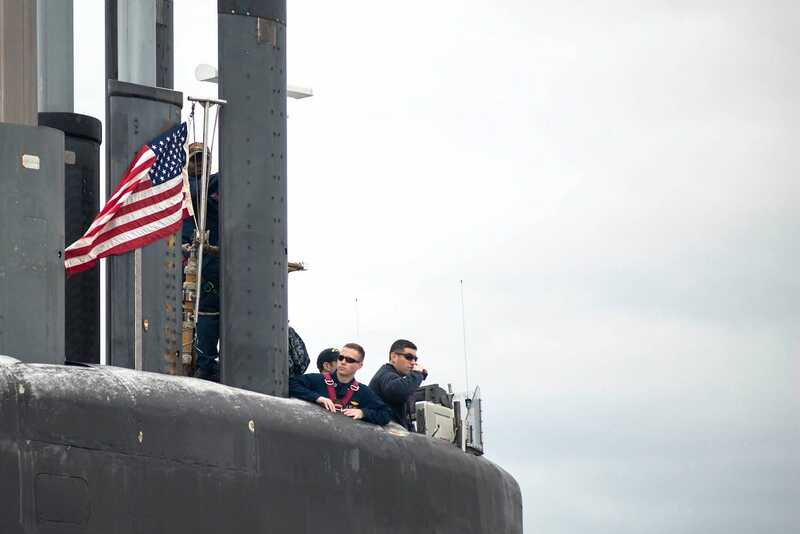 Specialist 1st Class James KimberSailors stand watch on the conning tower of the Ohio-class ballistic missile submarine USS Tennessee as it returns to Naval Submarine Base Kings Bay, February 6, 2013. While it isn’t standard, most US submarines do use popcorn for man-overboard drills, Cmdr. Sarah Self-Kyler, a public-affairs officer for the Navy’s Atlantic submarine forces, told Business Insider on Tuesday. The popcorn and the bag it comes in are biodegradable. The bag, once the popcorn is popped, is also about the size of the human head and equally hard to see when its bobbing in the ocean, Self-Kyler added. It will also float for a short period, usually less than 10 minutes, and disappear, adding time pressure to the exercise. Though different subs will handle things differently, such drills are typically only done while entering or exiting port, as that is generally the only time subs are surfaced. Many crew members have to be involved to carry it out. US Navy/Mass Comm. 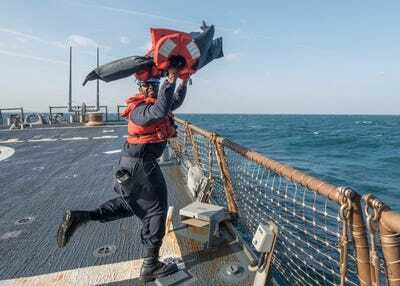 Specialist 2nd Class Jessica O. BlackwellSailors point to ‘Oscar,’ a training dummy, during a man-overboard drill aboard the guided-missile destroyer USS William P. Lawrence, June 22, 2018. The popcorn, usually pulled from the sub’s general inventory, is popped in a microwave then sent to the top of the conning tower, where it gets thrown overboard. At that point, Self-Kyler said, sailors on watch will shout that a man has fallen overboard and crew members in the control room will mark its location. Above deck, watch-standers have to keep their eyes on and fingers pointed at the popcorn the whole time, so as to stay focused on the very small object as the submarine manuevers to come back alongside it, which you can see crew members of the USS Colorado, one of the Navy’s newest attack submariness, doing below. In the event of a real man-overboard, the submarine would also send out an alert to all mariners in the area, telling them via a radio call to keep an eye out for a sailor in the water and relaying their last known position. The sub’s crew would also be mustered for a roll call to identify the missing crewman. 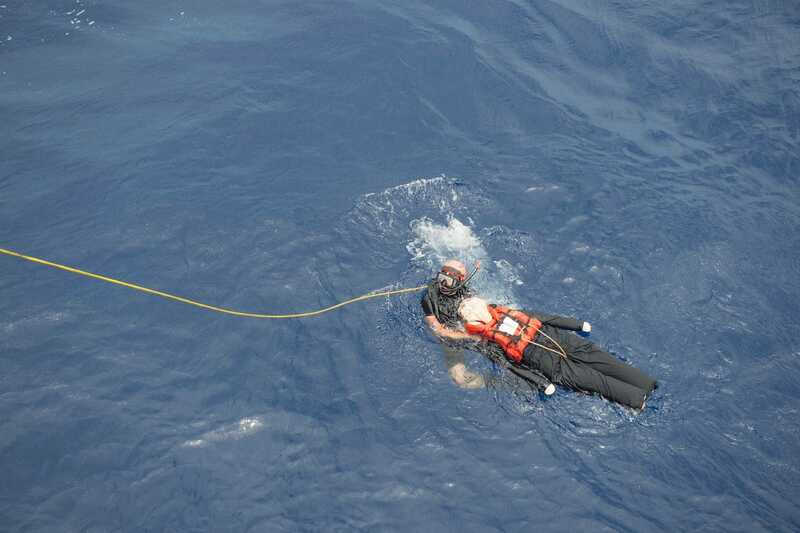 Bags of popcorn aren’t the only things submariners use for man-overboard exercises. They can also use cardboard boxes, Self-Kyler said, though whatever they use also has to be biodegradable. There are also specialised floats or mannequins that sailors use for search-and-rescue drills. US Navy/Mass Comm. Specialist 1st Class Tim ComerfordA sailor throws ‘Oscar,’ a man-overboard training dummy, off the port side of the guided-missile destroyer USS Mahan during a man-overboard drill, January 14, 2017. Navy ships do not use popcorn in their man-overboard drills, Jim DeAngio, a spokesman for the Navy’s Atlantic surface forces command, said in an email. A sailor going overboard is not a common occurrence, but it does happen. “In a man overboard situation, obviously, we want to recover the sailor as quickly and efficiently as possible,” DeAngio said. US Navy/Mass Comm. 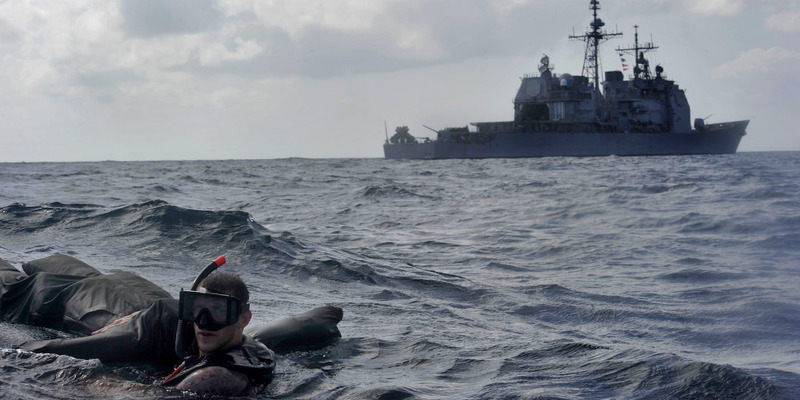 Specialist 3rd Class David A. CoxA Navy search-and-rescue swimmer rescues ‘Oscar’ and brings him back to the guided-missile destroyer USS Stockdale, July 15, 2016. A decade ago, the Navy introduced a Man Over Board Indicator for the float coats sailors working on deck are required to wear. A transmitter in the coat, a receiver in the ship’s pilot house, and a directional finder on a rigid-hull inflatable boat deployed to pick up the sailor were to be used in conjunction to make the rescue process a matter of minutes. Aircraft carriers, which have open flight decks and carry more crew members than other Navy ships, have nets along the deck to catch sailors before they hit the water. They don’t always work though. Peter von Szilassy, an airman on the USS Theodore Roosevelt in 2002, was blown by a jet blast in a bomb-disposal chute, one of the only areas without a safety net. He fell 90 feet into the Persian Gulf and was sucked toward the ship’s 66,000-pound propeller. But he was able to swim free and was picked up with little more than bruises. Navy search-and-rescue swimmers go through rigorous training to be able to pluck sailors out of the water within minutes – a life-or-death time limit when the sea is freezing. “When the three whistle blasts are broadcasted you have to be out there. It’s not about you. 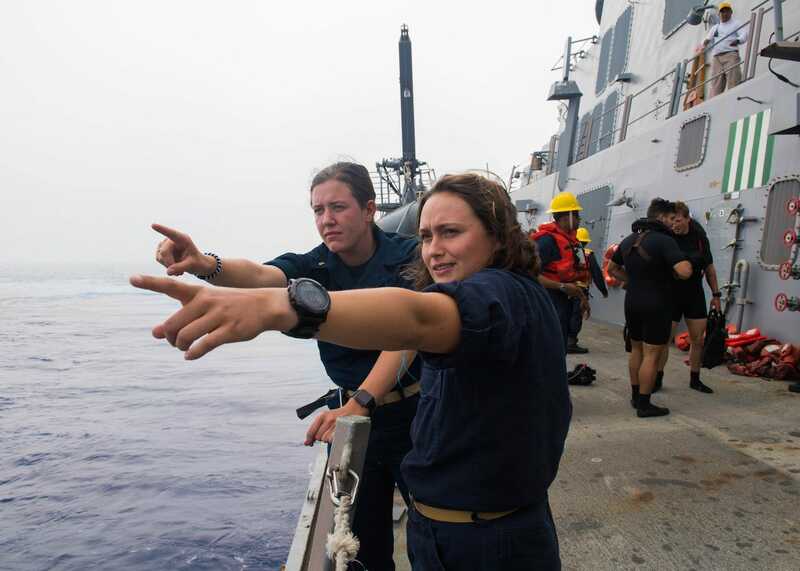 It’s about the person in the water,” Boatswain’s Mate 3rd Class Adam Tiscareno said earlier this year.